Chronic pain is one of the most difficult problems facing medicine and the neurosciences. Through the centuries, it has been a puzzle and still remains a challenge for research, given its complex nature. We can study it as a fluid system composed of interacting networks, the so-called “Pain Matrix”, bearing in mind that pain is the result of the continuous interaction of subsystems or networks. This assumes that major changes in the painful experience and cortical plasticity do not depend only on the action and interaction of dynamic brain networks but also on communication between the brain and external networks, such as socio-cultural factors modulating the perception of pain. The painful perception thus depends on a variety of external and internal influences independent of the nociceptive input. In this paper, I will explore the cortical mechanisms of physiological chronic pain as well as its cognitive and emotional components, pointing out that brain activity differs between acute and chronic pain and emphasizing the difference between pain and suffering. I contend that internal and external networks are interlinked, and I address the issue of chronic pain as a neuro-mental mechanism with neurobiological bases and as a subjective and qualitative mind experience, leading me to propose a new definition of chronic pain. Consequently, this paper is a discussion of the rationale and evidence for cortical reorganization as a consequence of chronic pain, and for the interaction between the neuronal and mental processes that modulate the aversive emotional component of chronic pain perception. Pain is defined by the International Association for the Study of Pain (IASP) as “an emotionally disagreeable sensory experience associated with a damaged tissue past or potential or described in terms of such damage” (IASP 1986). But in the complex nature of chronic pain, other important aspects play a role, such as culture, beliefs or even economic components, which could modulate the cognitive and emotional character of chronic pain. Those external aspects form part of a system of interrelated neural and mental networks involved in pain processing. Pain is a legitimate sensation as well as a perception in the sense that the painful sensation is a perception of a reality, e.g. the same kind of pain is never perceived in the same way by two people, nor in quality or intensity. Even when the sensation is similar, the painful perception depends on the individual’s past, on their intellectual level, on their beliefs, on their culture, on their character, and even on their social and economic position. When pain persists and becomes chronic, it induces a negative mental state resulting in suffering. However, even suffering could be a source of chronic pain. Therefore, we are considering a noxious circuit in which mental states transform physical states (neuronal networks involved in the perception of pain) and vice versa. The level and intensity of suffering will depend on several internal and external factors that could become serious physical problems as well. 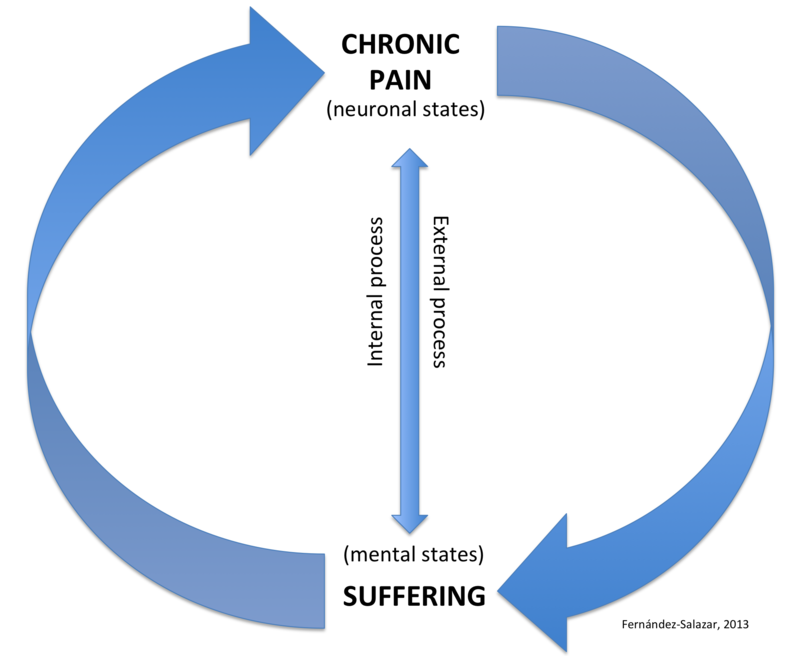 Chronic pain can result in suffering (Figure 1), producing other clinical manifestations such as depression, anxiety, etc., thus creating a neuro-mental or body-mind noxious circuit (Figure 2). Pain, like other perceptions, can result in hallucinations, illusions (such as a phantom limb pain), cognitive influences (such as the analgesia of the soldier or the athlete), and pathologic elements in which the stimulus is disassociated from representation. The pain of a phantom limb shows that the brain generates the experience of pain and we do not need a lesion to perceive pain nor a body to feel a body. The perception of pain is always subjective since it is the interpretation of the noxious sensation, and this interpretation depends on the past of the individual and her/his social and cultural background. It has been suggested that chronic pain would be the subjective representation of a corporal injury that includes the sensitive element (the pure aversive sensation), the affective (the negative emotions caused by pain), the volitional (disposing action), the cognitive (the recognition of the injury, identification and explanation of the perception of pain), the behavioral (the movements, lamentations), and the cultural element (modulation of the painful experience caused by social and cultural factors, as well as the influence of personal beliefs) (Díaz 2008). These elements join together to produce a complex representation of pain in which each element reveals itself as physical and mental. One should be capable of integrating the objectivity and subjectivity of chronic pain from a psychophysical approach (in the etymological origin of relating mind and body) and a cognitive and philosophical approach. This means studying chronic pain as a neuro-mental state. But before discussing the neural and mental bases of pain, it is important to remember that nociception is not pain and that brain activity differs in acute and chronic pain. These differences, as well as the interaction of the above mentioned socio-cultural factors, leads me to posit that chronic pain is so complex that we need to begin by redefining it. It is crucial to stress that nociception is not pain and that sensation is not perception. Nociception is a sensory signal that indicates potential damage. In contrast, pain is a conscious sensory and perceptual experience that depends on several factors. Nociception is defined as the afferent neural activity transmitting sensory information about noxious stimuli (Treede et al. 2006). This is the process by which intense thermal, mechanical, or chemical stimuli are detected by subpopulations of peripheral nerve fibers, called nociceptors (Basbaum and Jessell 2000). Even if nociception is often the cause of pain, it is not synonymous with pain, which can occur in the absence of nociception. There is a transition from nociception to pain perception that involves areas such as posterior parietal cortex, prefrontal cortex, anterior insula, and cingulate cortex (Apkarian et al. 2011). Some structures that are implicated in pain perception are not involved in nociception. In addition to the above differentiation, it is necessary to identify the important differences between acute and chronic pain, thereby avoiding generalization in the term pain. Acute pain is identified not only because of its duration in time, but also because it responds to a physical stimulus that ceases once the aversive stimuli stop. The sensation in acute pain is due to the pure activation of nociceptive pathways. This is not always the case in chronic pain, which persists in time and is not always the result of an injury. This is one reason why the treatment of chronic pain is often difficult. In the clinic, acute pain disappears when the underlying cause of pain has been treated or healed. In contrast, chronic pain persists despite the fact that the injury has healed, and pain signals remain active in the nervous system for months, years and in many cases forever. One of the characteristics of chronic pain is painful perception in the absence of a physical stimulus, which is known as “spontaneous pain” (García-Larrea et al. 2002). Moreover, brain activity resulting from acute pain stimulation in healthy people is not the same as that generated in people with chronic pain (Apkarian et al. 2011). Apkarian’s group demonstrated, in a study of chronic back pain patients (CBP), that the brain resting-state network (during rest multiple cortical brain regions are functionally linked, forming resting-state networks) is altered and shows changes due to the presence of chronic pain in those patients. In contrast to acute pain, patients with chronic pain often show hyperalgesia or allodynia as well as other somatosensory abnormalities (Birklein et al. 2000; Clauw et al. 1999; Dworkin et al. 2002). Additionally, if we consider that neuronal plasticity may be regarded as the property of the nervous system that enables it to modify its function according to different conditions (Melzack et al. 1993), those conditions always differ between chronic and acute pain patients. It has been reported that regardless of the location or nature of different pain syndromes, patients with chronic pain show a significant reduction of gray matter in the cingulate cortex, orbitofrontal cortex, and insula (Burgmer et al. 2009; Gustin et al. 2011; Mordasini et al. 2012; Obermann et al. 2013), which does not occur in cases of acute pain. The brain in chronic pain shows abnormalities in gray matter, structural changes in white matter, and degrading of local networks (Farmer et al. 2012). It has also been demonstrated that there are important differences in brain structure between healthy subjects and chronic back pain patients, in that cortical reorganization involves affective and cognitive processing as well as somatosensory integration (Oshiro et al. 2009). Studies have demonstrated that overall brain activity patterns in chronic pain patients generally diverge from that seen in acute pain, particularly with respect to the emerging prominence of prefrontal cortex activations (Apkarian et al. 2005). Identifying these patterns with different activity and their links with the intensity of pain is a good way to improve the understanding of the clinical features of chronic pain based on brain parameters according to their different conditions. This opens the window to an extensive analysis of the overall changes in modular organization of the brain in chronic pain, suggesting that we need a new definition of chronic pain that includes the reorganization of the cortex. Chronic pain might be associated with an increased functional correlation of brain regions involved in the processing and the integration of sensory, affective, cognitive and socio-cultural components, in which learning and memory have an inherent engagement. Chronic pain is a continuous learning state, in which aversive emotional associations are continuously made with incidental events due to the persistent presence of pain. Depending on the intensity of pain at the moment when a person in chronic pain enters a specific place, the perception of that place will differ from pain-free moments. The person establishes a negative association with the place (place conditioned avoidance), and the stronger the pain, the longer lasting will be the memory of this negative association (Apkarian et al. 2011). Learned associations that reinforce the chronic state might also be coupled with genetic predispositions. (Lacroix-Fralish et al. 2007). All this compels us to reconsider the definition of chronic pain. Accordingly, I suggest that chronic pain should be considered an unpleasant sensory, cognitive, and emotional experience. That is, chronic pain should be considered a continuous learning state involving the persistent pain memory evoked by an initial injury that extends beyond the expected period of healing, causing structural changes, cortical reorganization, and brain activity modification. In addition, the aversive mental states in chronic pain are transformed into permanent suffering and depend on biological, neurophysiological, socio-cultural, and economic factors, e.g. the interaction of the internal and external dynamic networks that modulate the intensity and the quality of the pain. The subjective quality of chronic pain, which in philosophy sometimes is identified as qualia, is part of the complexity of pain. The subjective and therefore individual aspect of the chronic pain experience depends on the relationship between brain activity during the process — which has been called “Neuromatrix” and recently “Pain matrix” — and the heretofore unknown mental activity, which in turn depends on a symbolic socio-cultural exo-network. The “Neuromatrix” was described in 1999 by Melzack. Recently, it is more common to refer to a “Pain matrix” that can be described as having lateral (sensory-discriminatory) and medial (affective-cognitive-evaluative) neuroanatomical components (Albe-Fessard 1996). Some authors propose that these different areas constitute a set of structures that interact and that it is the overall pattern of activation that contributes to the process of the painful perception (Tracey et al. 2005). Other authors argue that the “Pain matrix” is a group of different areas with specialized sub-functions that encode a specific aspect of the experience of pain (Rainville 2002). In any case, its components are not well defined. Several structures are part of this network, e.g. basal ganglia, cerebellum, amygdala, hippocampus, and areas within the parietal and temporal cortices can be active depending on the particular circumstances of the individual in pain. Some authors consider that it is necessary to move toward an individualized neural “Pain signature” rather than forcing this subjective experience into the constraints of a rigorous neuroanatomical Pain matrix” (Tracey et al. 2007). Therefore, the “Pain matrix” should not be seen as an independent entity but rather as a substrate that is significantly and actively modulated by a variety of brain regions, and it is this interaction that largely determines the experience of pain (Tracey et al. 2007). Taking into account these ideas, I suggest that the painful experience is not only determined by this interaction but by the relationship between the “Pain matrix” and the external dynamic network, such as culture, economy, etc. We are not able to explain the whole chronic pain process based solely as a brain process, but instead, we should analyze the process as a whole consisting of the constant interaction between the external factors (which are also part of the mental process) and the neural process. Both of these are intimately related to consciousness and its relation to the brain. If we follow the scheme of the “Pain matrix” (Legrain et al. 2011; Tracey et al. 2007), suffering, as the result of chronic pain consciousness, would be part of a network consisting of the orbitofrontal cortex and structures such as the basal ganglia, the amygdala, and the hippocampus. In this state, pain perception is modulated by emotions as well as by external dynamic elements such as beliefs (influenced by society) and culture, producing suffering as a result of a chronic pain process. The same idea could apply in recent studies proposing the existence of a specific brain activity pattern for pain (Wager et al. 2013). Using thermal stimuli of increasing intensity, the authors identify a pattern of weights across brain regions that can predict pain. They developed what they call a “Neural pain signature” (NPS) by defining a brain pattern with determined weights that predict pain. They also evaluated the ability of the NPS to discriminate pain during different tasks and its response to an opiate analgesic. In this way, they described which parts of the “Pain matrix” are most predictive of how much pain a person feels. But when the authors tested their study, they found that an NPS derived from acute pain most likely does not generalize to chronic pain (Farmer et al. 2012); this implies that the subjective perception in chronic pain is related to individual mental states that modulate the whole experience, making it impossible to measure in experimental studies. Nevertheless, it is interesting to think that we all have a genetic pain signature in our brain. I believe that in cases of chronic pain, this “neural signature” is modulated by external inputs interacting with the brain networks involved in the pain process. This process cannot be explained entirely without the mental states that are processed not only internally but also externally taking consciousness into account. The brain is partly constructed by its “Cultural prostheses”, that is, by external socio-cultural elements that complete it (Bartra 2006). According to this author, the neuronal circuits are socio-dependent and operate as a symbolic system of substitution. This symbolic system, called “exobrain”, interacts with the brain via intrinsic communication. It is this internal and external interaction that may modulate the genetic pain signature when a painful experience becomes chronic. The painful experience involves diverse associations between sensory and perceptual states. Therefore, pain is not only an aversive sensation but also an emotional perception and can in addition be a cognitive and a mental experience as described above. This definition goes against the beliefs of some neuroscientists who take sensation and perception to be the same thing and maintain that pain is a noxious sensation generated by neurobiological mechanisms taking place in the body. The perceptual subjectivity of chronic pain not only depends on internal mechanisms but also on an external social and cultural network interacting with the brain. The emotional scope of pain has much to do with the historical culture of the individual and contributes in an intimate way to the genesis of chronic pain. Beliefs, motivations, education, and even economy (if we think about pain in underdeveloped countries) are implicated in the painful perception. If we consider the possibility of an external network for processing perceptual experiences, then beliefs are external elements because they are formed in our early education and built up by social factors experienced during our lifetime through interaction between brain processes (memory of course is involved). Our past experience is not only an internal mechanism but also stands by itself. Its character could be in part genetic but its quality also depends on external experiences during life due to the interaction with society and culture. Thus, the cognitive and emotional experiences are constantly modulated by endogenous and exogenous influences that constitute the mental aspect of pain perception. When considering the subjective perceptual process of chronic pain, it is imperative to emphasize the difference between pain and suffering. We know that pain is necessary as a protective warning signal. We may not suffer if we experience acute pain, e.g. if I burn my hand it will be painful and immediately I will withdraw the hand from the fire. I am able to envisage the consequences of the burn and I know that the pain will pass even if it may persist for hours or days. However, this does not make me suffer. Suffering should be seen as an aversive emotion in which distress, sorrow, grief, unhappiness, misery, affliction, woe, etc. may be involved. Suffering is a mental state and its quality and intensity depends on our past experiences, memories, education, and beliefs. Suffering depends on our culture and economic situation. In chronic pain, the predictable consequences are dramatic, the natural restitution process seems to be absent, and the picture of our future often seems hopeless. Suffering caused by chronic pain can modify the perception of our body, our life, and our perception of the world, but the opposite can also be possible. The circuit works in both ways (Figures 1 and 2). Chronic suffering can also be the cause of chronic pain. Chronic pain is poorly understood in part because we insist on studying it solely in the brain and neglect the interactions of the brain with the environment. The external factors that intensify the painful perception in our mind can modify its quality. But we also neglect the possibility that suffering caused by dramatic experiences in the life of the individual could be the cause of chronic pain. This is not surprising given that the same structures of the limbic system are involved in the emotional process (suffering) and in the perception of pain. It has been proposed that neuronal states are the internal physiological mechanisms of pain interacting with mental mechanisms, which are processed in the brain in a constant relationship with socio-cultural networks intimately connected to the central nervous system (Bartra 2006). If we think of mental states as emerging properties of cerebral activity influenced by external factors, we could think that pain corresponds to a neuro-mental state. However, such emergence, e.g. a functional property in which consciousness would be involved, should be correlated to a physiological process and should be well defined. But for now we are incapable of such a definition. This is partly because we cannot construct an experimental model of consciousness or mind, which leads us directly to the mind-body problem. Hence, it is necessary to study the interaction of mental and neuronal states. Figure 1. The Neuro-mental chronic pain and suffering circuit. Neuronal and mental states do interact via internal and external processes, which results in a noxious circuit of chronic pain-suffering-chronic pain. For a detailed model, see Figure 2. Emotions have strong effects on pain perception. There are many mechanisms underlying the emotional modulation of pain, reflecting the important interconnections between pain and emotions, between suffering and pain. Suffering might not be only the consequence of chronic pain but also the cause. Studies have shown that emotions induced by pleasant or unpleasant images modulate the responses to painful electrical stimulations, especially in those structures of the pain matrix that are subsumed under affective regions (Rainville et al. 2009). Chronic pain arises from brain oscillations that are generated by the integration of endogenous information modified by external information, which modulate the emotional dimension of pain, resulting in suffering. A large part of the brain is involved in every painful process, depending on the type, quality, and intensity of pain. In a meta-analysis, chronic neuropathic pain studies showed increased activation in the left secondary somatosensory cortex, anterior cingulate cortex, and right anterior insula when compared to experimentally induced pain. The activation of those structures suggests a strong emotional contribution to the processing of chronic neuropathic pain (Friebel et al. 2011). Fear, anxiety, irritation, anger, discouragement, etc., are always parts of the painful experience. These aversive emotions transform the “normal” sensation of acute pain to a “deviant” perception of pain, modifying its quality and intensity. Other factors, such as decision making, determination, and planning also come into play, creating different negative scenarios for the future of the individual in pain. These can provoke major depression, which is one of the consequences of chronic pain. This is a stage where suffering can become as chronic as pain in the individual. However, the opposite is also possible because the modulation of emotions can occur in both directions. Perception is an active selective process that affects, and is affected by, the state of mind of the subject. Thus, the active selective perception of pain can modify the mental state of suffering of a person, which in turn can modify the active selective perception of pain. Pain and suffering constitute a noxious and sometimes a vicious circuit (Figure 2). Figure 2. Detailed unified neuro-mental model of chronic pain and suffering. This process involves not only the pure pain sensation but also the noxious perception. Emotions, cognition, and external elements, such as culture and other conditions, influence our perception and consciousness of pain. Neural states interact with mental states in both senses, causing a noxious circuit, which may start in chronic pain and cause suffering or vice versa. This diagram of the interaction of pain-suffering-pain opens the way to the study of the consciousness of pain, to the analysis of the relationship between the qualitative character of the subjective mental states of the painful experience in correlation with its neurophysiological mechanisms. It has been suggested that interactions of pain with other somatosensory submodalities, and with visual information about the body, offer the possibility of modulating chronic pain (Haggard et al. 2013). A good example is the mirror box proposed over 15 years ago (Ramachandran 1998), where its therapeutic effect seems to work by “tricking” the brains of amputees and thereby reducing their phantom limb pain (Lamont et al. 2011). Other recent studies report that for patients with chronic hand pain, magnifying the view of the limb during movement causes a significant increase of pain, whereas minifying the view of the limb decreases the pain (Moseley et al. 2008). Those studies support the hypothesis proposed in the above model that mental states may control physical states, thus demonstrating the relation between the body and the mind, as well as the circuit between pain and suffering. The distorted body image of an amputee might cause an aversive mental state which, when increased in intensity, results in suffering. This mental state might secondarily produce chronic pain, which can be modulated by changes in suffering. It can also be modulated by “tricking” the brain by using false images that artificially restore the amputated body and temporarily decrease the pain perception. I think that if we continue searching in this direction, we shall be able, through physical-mental therapy, to modify the aversive mental states caused by chronic pain or suffering. Chronic pain is a temporal process in which different elements are linked and mixed in diverse ways to form a complex distinct representation. This could be called a painful consciousness. It is not clear how to distinguish these elements because the painful experience is integrated by the fusion of the elements where the spatial location of pain can be disconcerting. Irrespective of the type of pain, the individual who perceives it makes reference to the place of the lesion. However, we know that the mechanisms responsible for chronic pain are at least partially in the brain (although the brain itself fails to be sensitive to injury, which is a strange and ironic fact). However, little is known about the consciousness of pain perception. It seems obvious that everything that occurs in the mind depends on something that occurs in the brain. But mental states and events, and their features like intentionality, subjectivity, and the conscious experiential quality, seem not to be comprehensible in terms of the physical operation of the brain (Nagel 1993). Mental states are possible because the brain is in permanent and intrinsic communication with external networks. Those exo-networks have been defined as a socio-cultural prosthesis, which is part of a symbolic substitution. This hypothesis assumes that certain regions of the human brain genetically acquired a neurophysiological dependence on this symbolic substitution system in order to cope with the environment. This system is transmitted by cultural and social mechanisms (Bartra 2013). It is in the brain that sensations and perceptions are integrated, although we do not yet know how the distinctive quality of pain occurs. Because pain perception, as discussed above, is both an endogenous and an exogenous mechanism in which many external elements are involved that seem to be related to consciousness, we need new approaches to the study of its nature. Chronic pain perception remains an issue in the unresolved mind-body problem. Therefore, it should not only be studied from a neurophysiological perspective. Some philosophers approach the problem through the dichotomy between the phenomenological experience and the scientific evidence, e.g. in the location of pain: “a) The pain is in my fingertip, b) The fingertip is in my mouth (c) therefore, the pain is in my mouth”, or “I can perceive a pain in my finger but in reality it is in my brain and not in my finger” (Tye 1995). In the same way, we also could say that one can perceive the outside world as an exterior, but in reality this world is perceived by our minds. “… a pain in a leg (viewed as an experience) represents that a certain quality is tokened in the leg. It is accurate if that quality is tokened there; inaccurate otherwise. The term ‘pain,’ in one usage, applies to the experience; in another, it applies to the quality represented insofar as (and only insofar as) it is within the content of a pain experience” (Tye 2002). “To be in the same epistemic situation that would obtain if one had a pain is to have a pain; to be in the same epistemic situation that would obtain in the absence of pain is not to have a pain … . Pain … is not picked out by one of its accidental properties; rather it is picked out by its immediate phenomenological quality … . If any phenomenon is picked out in exactly the same way that we pick out pain, then that phenomenon is pain.” (Kripke 1980, pp 152–53). If there is no appearance/reality distinction applicable to pain, then it seems that one cannot be mistaken in one’s beliefs about one’s pain formed on the basis of feeling pain, as opposed to the way one can be mistaken about the existence and properties of the apple one sees. In the latter case, appearances can be misleading precisely because the perceptual appearance of an apple might not correspond to what the apple is like in reality. In apparent contrast to pain, normal exteroception always involves the possibility of misperception, and thus miscategorization (that is, misapplication of concepts to the objects of exteroception) (Aydede 2005). In those terms, chronic pain seems to be a matter of semantics and epistemology. However, a huge number of people in the world population suffer from chronic pain, and for an existing pathology such approaches might not be of much help. I believe that both neuroscientific and philosophical approaches are necessary for the study of pain. But if we really intend to unify philosophical knowledge with neuroscience in order to understand the nature of pain in its complexity, then both disciplines must stop working separately due to a lack of mutual understanding. The painful content of pain and the representation of this content have been studied by philosophers of mind. They have hypothesized that the phenomenal character of pain is a representational content of a certain sort, into which the experienced qualities enter (Tye 1995). Those qualities should be analyzed, but the question is how to describe them in order to study their nature if almost all of them are individual and subjective qualities. Indeed, how is it possible to quantify the painfulness of pain? We as philosophers and neuroscientists are still limited in providing concepts about the mind-body problem, about the nature of consciousness, and about the nature of pain based on experimental studies. For now it is not possible to construct a strong theory about any of those topics. I believe the principal reason is that we are unable to quantify the mental aspect of chronic pain, and chronic pain is part of the mind-body problem, being intrinsically related to consciousness. There is a suggestion that external stimuli may cause pain, but the pain itself is about the body, not about the external stimuli (Haggard et al. 2013). Haggard and colleagues have argued that pain is not only a distinct class of sensation, but also a distinct form of information about one’s own body. This proposition was suggested some years ago by representationalists and intentionalist philosophers (Jackson 1982, 1996, Dretske 1995, 1996, Tye 1998, Lycan 1996, 1998, Levine 2003, Crane 2003, Aydede 2005, Jacob 2010,) who still continue to analyze the character of the intentional experiences. I would agree that pain is a form of information about the body, as Haggard and colleagues suggest, but that it is also associated with a concept of one’s body and its relation to the environment. If the experience is always about something, then the pain experience should be about its quality, and the quality depends not only on the body but also on the mind of the individual in pain. These mental states modify the painful experience. In a number of functional magnetic resonance imaging (fMRI) studies, it has been proposed that the insular region is involved in the consciousness of pain and reflects the magnitude of subjective pain when the participants indicate the perceived magnitude of pain. This would show a linear correlation between brain activity and the magnitude of the subjective perception of pain (Apkarian et al. 2011). Although an image can show representation of the subjective painfulness of the participants and thus could be a reason for suggesting that the insula has a relationship with pain consciousness, it is necessary to extend this suggestion because the consciousness of pain involves the interaction of external networks that closely operate with these areas, such as the limbic structures. However, a narrower perspective of brain areas might not help to understand the complexity of pain perception. It is difficult to believe that we can explain the process of consciousness solely in the brain without taking into account external inputs arising from external networks that are part of the environment of the individual in pain. As I suggested, the internal processing of information resulting in pain consciousness is possible because of inputs from external networks, e.g. the culture of the individual, as well as her/his past experiences acting in an intrinsic relationship with the insula and other structures of the limbic system that are strongly involved in the conscious perception of pain and modulate its emotional dimension. Furthermore, the insula is a general monitor for body-sensations and emotional content. Functional imaging studies of the insula assist in the formulation of many paradigms of a cognitive, motor or emotional content. I partly differ with the above proposal of pain awareness proposed by Apkarian and colleagues because, according to this group, conscious perception of pain is the final product of the transformation of nociceptive information to the painful magnitude, which would take place in the insula. As I noted, the nociceptive information does not encompass the whole pain perception. At the level of nociception mechanisms, we are considering pure sensation. A discussion about perception and pain consciousness is not necessarily a transformation to magnitude, at least not in all cases of chronic pain. As I have suggested, painful awareness is due to external factors and its magnitude is different in each particular case and not dependent on its transformation. It depends on the quality of the external networks of the individual in pain acting with her/his internal cerebral circuits. This indicates that pain mechanisms in each particular case are different, hence, the complexity of its treatment. In all events, when speaking of consciousness, whether it be pain or all sorts of elements and events that surround us, it is not easy to make a distinction between mental representations, the stimuli which provoke these perceptions in the brain, and the quality of these experiences. It is in the convergence of cultural, social, cognitive and biological factors that consciousness emerges as well as pain, and its quality, magnitude and intensity depend on its emotional scope. The extreme complexity of physical and mental control systems in chronic pain is clear. Melzack (1973) suggested that the ideal objective is not to completely abolish the sensation of pain but to reduce it to tolerable levels. I would say that it is important not only to reduce the sensation to tolerable levels but also to study the mechanisms involved in the painful perception that modulate it. If we manage to understand not only how to reduce the sensation of pain, but also how to modify its perception through the modulation of its emotional character, we should be able to reassess and reinterpret the painful sensation by means of its type of perception devoid of the unpleasant features it entails. Chronic pain can physically destroy the subject of the pain. But once pain is mixed with a degree of chronic suffering, it can also destroy the individual mentally and socially. The relief of suffering for people in pain could be reconciliation with life and the world around them. If we follow the hypothesis I suggested, namely that suffering on its own can also cause chronic pain, it may be important in many cases to treat suffering first by studying the mental states of the individual to better understand the nature of chronic pain. 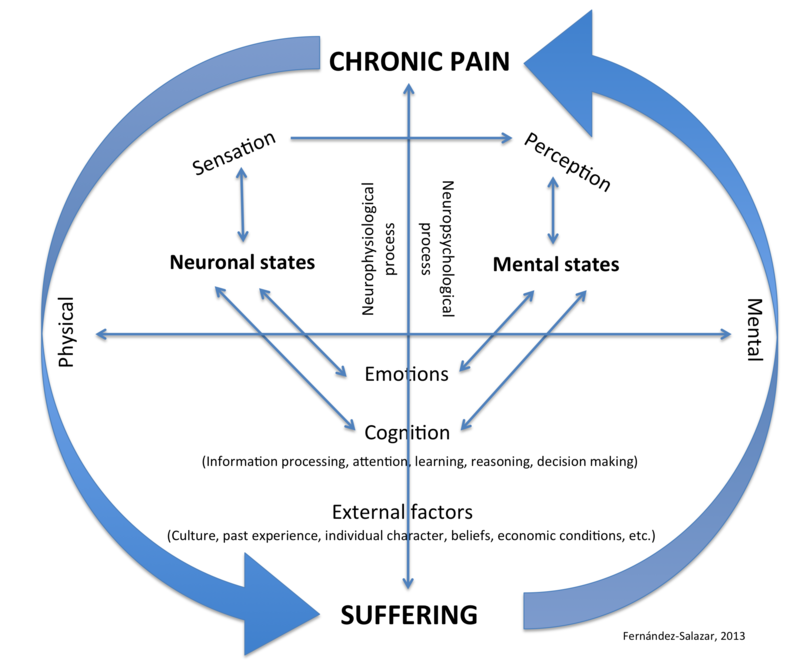 The diagram of chronic pain-suffering proposed in this paper shows the subjectivity of chronic pain and the importance of its emotional dimension, as well as the need to focus on the modulation of the individual’s pain perception and not only on the issue of how to reduce the neurophysiological pain sensation. The modulation of the emotional component of chronic pain represents a first step in alleviating the aversive mental states that chronic pain provokes. For the effective development of better therapies for the treatment of chronic pain and to remove the negative emotional aspect, we need to undertake a more detailed analysis of the reorganization of the cortex in chronic pain and the consequences this entails, as well as a deep study of the emotional dimension of chronic pain, which is one of the bases of these brain alterations. In addition, we need to better understand the interaction of the ascending and descending pathways of the external networks that modulate the painful experiences. We do not yet know the nature of pain, probably because we cannot presently explain the nature of consciousness or mind. I believe that it is the intrinsic relation between body and mind that someday could explain the nature of pain. Chronic pain affects million of people in the world and the lack of its understanding leads to delayed or erroneous diagnosis as well as to inadequate therapies. The study of neural and mental states is essential to cope with the complexity of the experience of chronic pain and suffering, which affects such a substantial dimension of the human condition. 1. Allodynia is defined as inappropriate pain in response to a normally innocuous stimulus, while hyperalgesia refers to enhanced pain sensation to a stimulus that is noxious (Merskey 1986, Bennett 1994). 2. The properties of any subjective experience without describable physical information, these properties together make up the phenomenal character of the experience. Qualia, (the plural of Quale) have a central importance in the mind-body problem. 3. An age-old philosophical problem concerning the nature of mind or consciousness and its relationship with the physical world. 4. In philosophy of mind, intentionality is the power of minds to be about, to represent, or to stand for, things, properties and states of affairs (Jacob, 2003). Intentionalism is sometimes called representationalism; the difference is purely terminological. Cognitive Critique is published by the Center for Cognitive Sciences at the University of Minnesota. ©2016 Regents of the University of Minnesota. All rights reserved. The University of Minnesota is an equal opportunity educator and employer.